After having booked Air Asia tickets from Chennai to Melbourne and back (all these bookings are for 2016, very long way to go, I am still in planning phase), I was temped to accommodate Sydney also in the same trip, keeping 3-4 days at Melbourne and remaining 2-3 days for Sydney. I have decided to take Grayhound overnight bus to Sydney (With stop over at Canberra) and return by flight to Melbourne to catch my flight back home. (Modifying AirAsia ticket to return directly from Sydney was proving to be expensive, very expensive). In fact Grayhound Australia's Melbourne Sydney ticket is 25% more expensive than Tigerair ticket- but I can save one day hotel expense, save on airport transfer etc, get to see Canberra on the way. So overall it should be good deal. I checked for cheapest flight options between Sydney and Melbourne, Australia. It was TigerAir. Coming back to Tigerair ticket booking, it was the cheapest way to fly between Sydney and Melbourne. It was 42 Australian dollars one week back, with 20 AUD for 20kg luggage, overall was coming to 65 AUD. Because I delayed by decision by a week, fare shot up by 10 AUD even though travel date is 9 months from now. Still at 75AUD, Tigerair was still 40% cheaper than next best option, Virgin Australia. Prices keep changing over time based on date, occupancy, promo and several other factors- it might even be cheaper in future. (Update: One of my anonymous reader suspects cookies might have pushed the price up- need to be very careful on this aspect)There was no Two factor authentication when I booked on Tigerair Australia- this is worrying. Tigerair gives some useful info while booking tickets- such as how many other people are looking at same Origin-destination, how many seats are remaining at this price and so on. Very useful to know what's the competition you have for the low price tickets. Then there're a host of optional extras. A 20kg check-in luggage could cost anywhere between 15-40% of the ticket fare, based on sector. Then there's TigerPlus- that offers premium lounge access, priority boarding etc, meals, insurance, seat selection and so on and even SMS alert costs extra (About 1 USD). While I have flown Air Asia several times, I am yet to experience Tigerair. They are the co-sponsors for our Singapore trip next week, so I am flying them soon. Will share Tigerair's in-flight experience later in a separate post. I do not understand this tiger connect thing... What is so special about this? 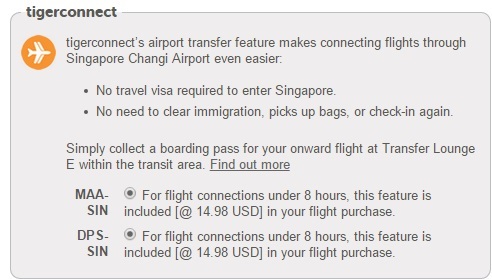 None of the passengers transiting through Changi need transit visa or have to clear immigration or check in again. That is not airline's decision or offer. Boarding pass for second leg of the journey can be issued at Origin itself. Effectively this amount is being charged (or rather factored in ticket) to move our check-in bags from one aircraft to another. Airasia doesn't do like this. If not for tiger connect, you need to collect your bags, clear immigration, go out, enter via departure gate, get fresh boarding pass and check-in again, clear immigration again. I checked if it will be cheaper to book two separate return flights, but that wasn't helping, probably because of other pricing factors. Once you select an origin, AirAsia website shows only those destinations to which tickets can be booked from that origin. But Tigerair shows all destinations for all origins and then we get to see a message that there's no flight or fare available. For many of the common destinations I tried- such as Chennai- Bali etc, Air Asia was still a bit cheaper compared than Tigerair. AirAsia lets me select a currency from a set of currency options, including INR for India outbound flights, but Tigerair doesn't give me INR as currency option (Even for India outbound trips). Below is a simple table comparing the two budget airlines of Asia. Note that this analysis is only for one destination and date range. Depending on destination and time, the price can vary and so is the difference. Each airline will have their strong and weak destinations. Can we see how many seats left at this price? Can we see if rates are cheaper on nearby dates? But it is not practical to fly international for one week without a check in bag. Note while extra service charges are usually fixed, base fares are highly dynamic and vary over time, making all the difference in overall price. Above comparison should not be used to decide which airline will be cheapest always. 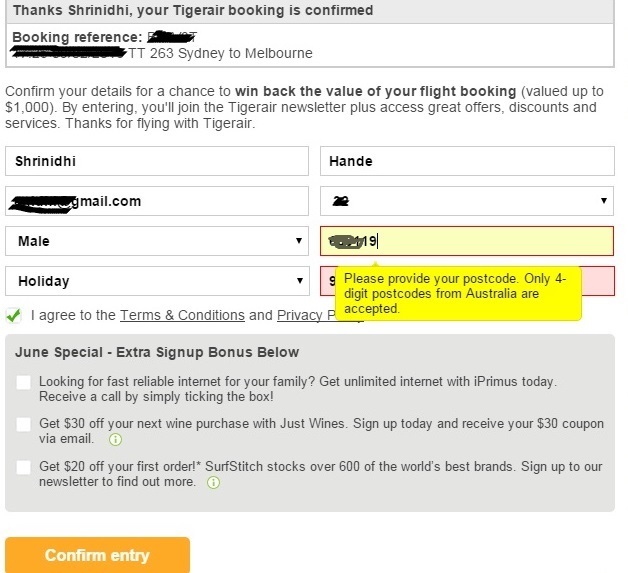 After I booked my Sydney-Melbourne flight, Tigerair prompted me to sign up. But it wouldn't accept Indian phone number and pin code, which were mandatory fields, so I couldn't sign up. Not sure why they want only Australians to sign up on Tigerair Australia. Why can't I sign up with only Name and Email ID from anywhere in the world? Their call centre confirmed that I can't sign up on their site. Air Asia has got better systems in this department to manage our accounts and booking. Also Web Check-in is not available for flights out of Chennai. Above: When I attempted web check-in, website says no web check in possible and Check-in counters open 2 hours before departure time. Below: My ticket suggests I should check-in three hours before departure time. If counter opens 2 hours before, what am I supposed to do going to airport three hours before? Why am I asked to come 3 hours earlier? I think they have taken it for granted that Indians won't come on time, so suggesting an hour of extra time? Not sure. Unlike AirAsia which has full scale India operations now, Tigerair doesn't seem to be focused much on India market. They don't give INR as currency option, no Indian toll free number on the Contact US section, no web check-in for Chennai (not sure of other cities). Nevertheless, I am looking forward to flying Tigerair next week. I will write another post about the flying experience later. You can follow Tigerair on twitter @tigerairsg. All prices as seen on respective sites when this post was being drafted. Current prices may be different. Pls perform your own validation before final decision. No 2 factor authentication? I thought RBI made it mandatory for all online transactions. BTW depending on your credit card, you may get free access to airport lounges. Check with your bank. Correct. I was expecting an OTP, but I got booking confirmation instead. Also agree cookies might be involved. Need to be more careful though I clear them periodically. I have heard of the cookies and price increase effect too from friends. Hence, it is wise to use another device to book the same destination tickets. However, I am not entirely certain of the truth behind those claims but it doesn’t hurt to play safe. I also suggest taking the local buses to hop from one city to another wherever possible like how I do when I have to jump from one self storage to another for work purposes.